Each year, the board of the church draws up a new budget, which you as a congregation approve at the annual meeting. Each committee puts forth to the board a request for the amount that they need to do the work that they are commissioned to do on behalf of the congregation. Gifts to the Mission and Service Fund make a difference far beyond what many of us understand. Think of daily life in your church. This fund has contributed to the training of people offering leadership, ordained or lay. The Voices United hymnbook was made possible by early M&S support. Perhaps a technology grant helped purchase a copier, a keyboard, or a computer in your church. The Capital Assistance Fund might have repaired the roof. 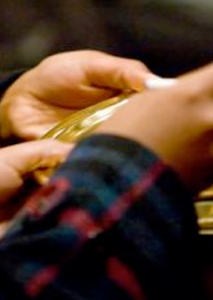 The thoughtful commitment of people across the land prayerfully offering their gifts regularly through the fund is reflected throughout our faith community. This line on the envelope is probably the least understood. If you would like to make a special gift to the Sunday School, Choir, or perhaps there is a special appeal from the United Church, such as for Haiti or the Philippines disasters, then this is where you would record it. If you put an amount for special, but do not indicate where it should be used, then it would be used as local funds. As a charity, we are not allowed to accept and forward funds to other charities unless a special appeal has been issued. The building fund was developed to help the Administration & Management Committee pay for the extraordinary expenses that come up throughout the year that they have not been able to budget for. This fund is kept separate from the local funds. Replacing the light bulbs in the sanctuary, etc. We also use this fund for Manitoba Hydro’s Powersmart program, where we replaced the bulbs in the exit lights around the church, updated the florescent fixtures in the narthex and office areas, and put time out lighting in the areas where lights are most frequently left on with no one in the room. As well, it helped pay for the new boiler. This has helped us to lower our hydro bill. By giving to this fund on a regular basis you have enabled us to keep the church in good condition that you as a congregation can be proud of.